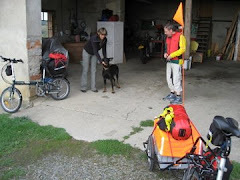 Tim Burleigh, a friend of ours who writes and publishes the excellent BicycleGermany web site on the joys and possible pitfalls of cycle touring in Germany wrote to us recently about some new ideas for the website. It would appear that some airlines are demanding $250 for the one way carriage of a bicycle from the USA to Europe or vice versa, i.e. return costs of $500. At the present rate of exchange $500 is about 370 Euro. For this sum of money you can hire a 21-27 gear trekking bike for about 3 weeks. However you will need to take the bike back to the hire company, which even after a short linear trip like the Romantic Road from Würzburg to Füssen will cost you the better part of a day which for two people and bikes will cost at least 25 Euro each. It may be more convenient and even cheaper for a longer trip to buy a cheap bike at the start of the trip and get rid of it at the end. If you have family or friends in Europe this is an easy option, otherwise it could be difficult. You could always give the bike to a church or a charity. Obviously if you are planning to come back the year and have no relatives or friends in Europe after you can try to find a bike shop to leave the bicycle there for the winter. Various of the supermarkets in Germany like Aldi, Real or Lidl, the coffee roasters Tchibo and DIY stores sell their own brand bicycles for prices that one can hardly believe. You can buy a bike for less than 200 Euro. They have one major snag however. Most bike shops won't touch them if repairs become necessary or will charge you serious sums for the privilege of repairing the bike. The best option is to buy a Pegasus bicycle from a purchasing cooperative called ZEG. They sell these bikes through local bicycle shops in Germany, not all but a lot and in the Stadler chain of bike supermarkets. These bikes can normally be obtained for between 300 to 500 Euro.